Songs have been sung and volumes of books have been written about the famous Route 66. Much of the development of the West is owed to this highway stretch leading to California. Get your kicks on Route 66. For the Platt family, though, it's been U.S. Route 62 where we get our kicks. 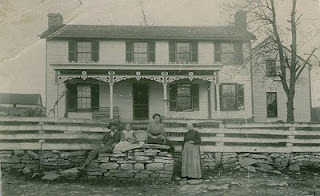 It was pointed out to me recently that my great-great-great grandfather had a house in Nelson County, Kentucky. Looking it up on Google Maps, I see US 62 runs right through it. He wasn't the only one with roots along Route 62 in my lineage. One of my great grandmothers was born on a Revolutionary War grant farm just six miles west of US62 in New Vienna, Ohio. Her (and, thus, my) ancestors had been there for 200 years, give or take. My great grandfather on my dad's side grew up in Mercer County, Pennsylvania. US62 is the main route there too. My grandfather on my mother's side grew up in Hillsboro, Ohio and later moved to Columbus. Both along US62. My father was born in Youngstown and my grandparents lived there most of their adult lives. Yep, US62. My mom was born in Columbus. US62. I grew up in Massillon. US62 runs through there. And now my kids are growing up in Licking County. US62 goes right through here too. I guess my Route 66 is Route 62.